EDITOR’S NOTE: Updated at 0600 GMT (1 a.m. EST) after confirmation of successful launch. Liftoff of the four-stage PSLV, boosted by six strap-on solid-fueled rocket motors, occurred at 0359 GMT Friday (10:59 p.m. EST Thursday) from the Satish Dhawan Space Center on India’s eastern coastline, about 50 miles (80 kilometers) north of the port city of Chennai. It marked the PSLV’s return-to-flight after a four-month grounding in the wake of a failure in August. The doomed Aug. 31 mission placed India’s IRNSS 1H navigation satellite into orbit, but the PSLV’s payload fairing — the shroud designed to protect the spacecraft during the first few minutes of flight — failed to jettison soon after liftoff. The failure stranded the IRNSS 1H satellite on the PSLV’s upper stage, leaving it unable to separate from the rocket to begin its mission. Investigators probing the failure identified an anomaly in the fairing’s pyrotechnic separation mechanism, which was supposed to shear the rivets connecting the shroud’s two clamshell-like halves. Indian news reports said there was not enough pressure build-up from the detonation of pyro charges along the fairing separation plane to push the nose cone’s two sections apart. 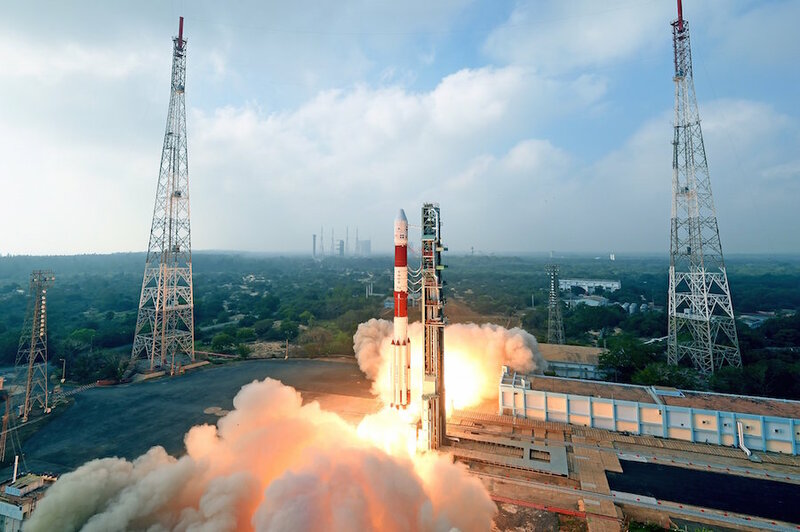 The Bangalore Mirror reported that officials with the Indian Space Research Organization said there were no design flaws or fundamental problems with the PSLV. 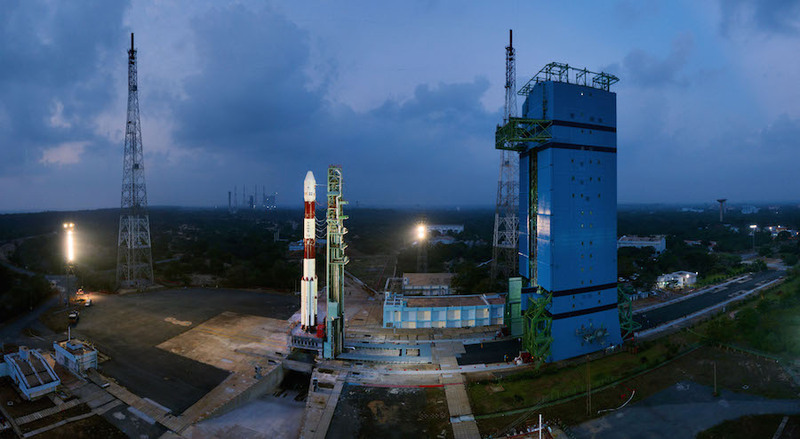 Few details were released on ISRO’s plan to fix the problem, but the next PSLV flight was delayed several months while engineers studied the failure and developed a corrective plan. The Aug. 31 failure broke a string of 39 successful PSLV missions in a row since 1993. The 144-foot-tall (44-meter) PSLV set for launch Friday delivered India’s Cartosat 2F mapping satellite to orbit, along with 30 secondary payloads for Indian, U.S., South Korean, British, French, Canadian, and Finnish customers. The rocket headed southeast from the Satish Dhawan Space Center over the Bay of Bengal, then turned south a few minutes after liftoff. The so-called “dogleg” maneuver ensured the PSLV does not fly over populated areas of Sri Lanka. The six strap-on solid rocket boosters — four ignited on the ground and two in the air — all completed their burns and jettisoned from the PSLV by T+plus 1 minute, 32 seconds. Burnout and separation of of the PSLV’s solid-fueled first stage, followed by ignition of the second stage’s hydrazine-fueled Vikas engine, occurred at T+plus 1 minute, 48 seconds. 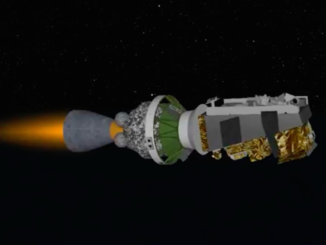 A solid-fueled third stage and liquid-fueled fourth stage completed the task of placing the satellites into orbit, with separation of Cartosat 2F — the mission’s prime payload — confirmed at about T+plus 17 minutes, 18 seconds. Cartosat 2F and 29 of the PSLV’s secondary payloads separated from the PSLV in a 312-mile-high (503-kilometer) sun-synchronous type orbit in the first 25 minutes of the mission. The co-passengers came from companies and institutions in India, the United States, Canada, Britain, South Korea, Finland and France. Two more burns by the restartable fourth stage steered the rocket into a lower 226-mile-high (365-kilometer) polar orbit for deployment of a mysterious Indian-owned secondary payload known only as MicroSat, according to ISRO. ISRO officials declared the launch a success in a press release. The biggest spacecraft on Friday’s launch was Cartosat 2F, a 1,565-pound (710-kilogram) satellite designed for a five-year mission collecting imagery of Earth for mapping applications, urban planning, agricultural monitoring, tracking the health of coastlines, measuring the use of water resources, and other purposes. Owned by the Indian government, Cartosat 2F is the seventh in the Cartosat 2-series of Earth-imaging satellites. ISRO said Cartosat 2F extended its power-generating solar arrays after deployment from the PSLV’s fourth stage, beginning an activation sequence to verify the satellite’s health. 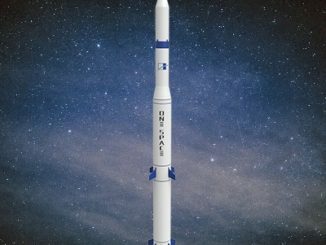 The co-passengers on Friday’s launch included Telesat’s second prototype broadband communications satellite, following on the loss of the Canadian company’s first experimental high-speed Internet craft on a failed Soyuz/Fregat rocket launch in late November. An experimental Earth-observing craft named Carbonite 2, made by Surrey Satellite Technology Ltd. in England, was also aboard the successful PSLV flight. The 220-pound (100-kilogram) Carbonite 2 satellite will test technologies to produce low-cost video imagery from orbit, and the mission was reportedly developed in partnership with the British military, according to Defense News. Carbonite 2 will produce 3-foot (1-meter) class high-resolution imagery and high-definition videos of Earth. It follows the launch of Carbonite 1 in 2015, a spacecraft SSTL used as a proof-of-concept for video from orbit. The British company Earth-i has ordered five satellites from SSTL based on the Carbonite design for commercial fleet intended to collect and distribute full-color imagery from orbit. The Earth-i satellites are planned for launch in 2019. “Today’s launch is a significant moment for the UK and global space industries with Earth-i’s progress being tracked across the world. Earth-i is an exciting and innovative British company and is a fine example of our thriving space sector,” said Graham Turnock, chief executive of the UK Space Agency. SSTL also manufactured the 370-pound (168-kilogram) test satellite for Telesat’s planned broadband network. Telesat ordered two demonstrator satellites in April 2016 from Space Systems/Loral and SSTL to help engineers wring out technical hurdles before the company builds out a 117-satellite constellation to provide global broadband communications coverage from orbits less than 1,000 miles up, a goal officials say could be realized by 2021. The SSL-built test craft was destroyed during a failed Russian Soyuz/Fregat launch in November. SSTL confirmed the Carbonite 2 satellite and Telesat’s payload radioed ground controllers as planned after Friday’s flight. Four CubeSats to add to Planet’s commercial Earth imaging network were also stowed aboard, along with four Lemur-2 CubeSats for Spire Global’s commercial ship tracking and weather monitoring constellation. Planet announced its four Dove CubeSats were healthy in orbit following the PSLV mission. 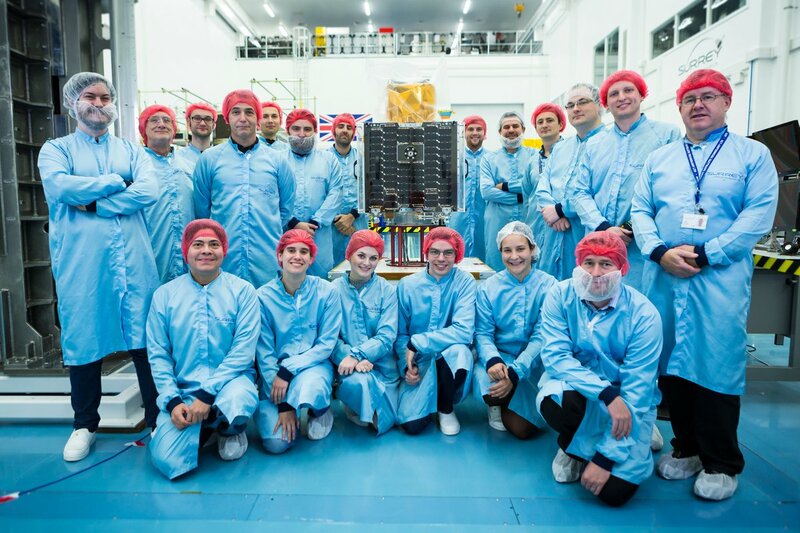 Seattle-based Spaceflight arranged for the launch of 11 of the secondary payloads on Friday’s PSLV flight, including the four Lemur 2 nanosatellites. A Finnish company named ICEYE launched its first microsatellite Friday with a compact radar package designed to gather all-weather, day-and-night observations of Earth. It is the precursor to a planned constellation of relatively inexpensive orbiting radar imagers that could track sea ice and oil spills. In a tweet shortly after Friday’s launch, ICEYE said its ground team was in contact with the ICEYE X1 spacecraft in orbit. A Landmapper-BC CubeSat manufactured and owned by Astro Digital, formerly Aquila Space, was also on Friday’s PSLV flight. It is the fifth Landmapper-BC satellites to launch, following two craft that flew on a Soyuz mission in July, and failed shortly after reaching space, and another pair that were lost on the failed Soyuz/Fregat mission in November. Planetary Resources launched its Arkyd 6 CubeSat, a spacecraft about the size of a briefcase, on Friday’s PSLV mission. It also checked in with ground controllers during a communications pass, confirming it survived the trip to orbit. Arkyd 6 will test out an infrared imager and other technologies Planetary Resources aims to put on future spacecraft that will prospect for valuable resources on asteroids, such as water, that could be used to make rocket fuel, oxygen and other supplies needed by future missions exploring the solar system.